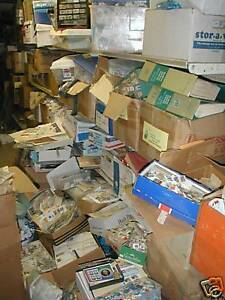 Détails sur 1000000's of STAMPS-ALBUMS-GLASSINES-MINT-SETS-Used-COLLECTION-LOT-DEALER CARDS! We accept Paypal or call our store to pay by credit card Mon-Sat 12pm-8pm EST (434)237-7649. Local In-Store Pick Up is also Welcome for no charge. Our Address: The Collector's Lair 5222 Fort Ave Lynchburg Va 24502. Listed shipping is for USA shipping For international orders, Please email for quote. International buyers are responsible for any customs fees. We have had a store in Lynchburg for 30 Years and on Ebay over 16 years - Come by and visit! Please call us with any concerns.Thanks!